` Beautiful, blue water sparkling in the sunshine—can’t you just see it now? Right there in your backyard, simply waiting for you and your family and friends to taking a running jump right into the middle of it! It used to be that swimming pools were reserved for the rich and famous, but now nearly everyone can afford to put a swimming pool into their yard. How is this possible? Surely most Americans can’t write a check for several thousand (or tens of thousands!) of dollars—right? Well, no; but fortunately there is no need to pay that kind of money out of pocket with new and affordable swimming pool loans from AMS Financial. When you’re in the market for a swimming pool loan, you don’t necessarily want to add this cost to your mortgage, or even a home improvement loan. Instead, you may want to preserve the equity that you have already built in your home and skip the time-consuming appraisals, additional paperwork and other hassles that you can encounter with a more traditional equity-based loan. A swimming pool loan from AMS Financial is quick and easy, and provides you with the money that you need to get the swimming pool your family wants quickly and easily and at a great rate. Unsecured financing doesn’t have to be scary, and there’s no penalty for needing a loan to purchase your swimming pool. Certainly, no one is going to judge you because you can’t write a check for such a large expenditure! Instead, you will be able to work with friendly and knowledgeable specialists who can ensure that you get the very best rate possible, and within the timeframe that you need. Get ready for summer with a swimming pool loan that will let you and your family enjoy the fun and camaraderie that comes with having the coolest yard in the neighborhood. With no prepayment penalties, and a simple 30-second pool loan financing application, AMS Financial offers terms as long as 15 years with a loan value up to $100,000 anywhere nationwide. You can even get pre-qualified without a credit inquiry, meaning you can apply with confidence and not be concerned about any impact to your personal credit rating! Don’t wait until you are ready to put in a pool to check your financing options. 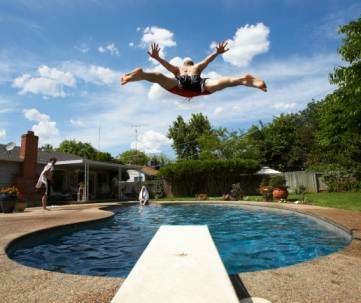 Go to www.MyPoolLoan.com to learn more and understand all of your different options for putting in a pool this year!